Bisection - The Chip's Challenge Wiki - The Chip's Challenge Database that anyone can edit! Bisection is the 57th level in Chip's Challenge Level Pack 4. It was created by Jeffrey Bardon. Make your way to the northwest corner of the level, being careful not to trap yourself behind any force floors. Pick up the suction boots and go to the northeast corner of the level. 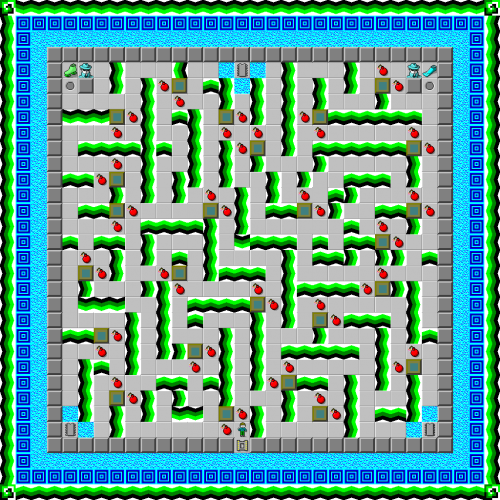 Before you pick up the flippers and while you still have suction boots, trace a path through the level which picks up the three chips and leads you to the socket. Use the blocks to blow up bombs as needed to create your path. 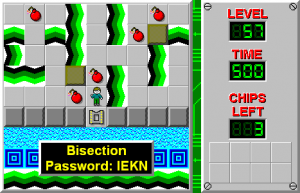 Note that for each pair of bombs, the block can only be used to destroy one bomb. Once you have found a valid path, go back to the northeast corner of the level, step on the thief and pick up the flippers. Use the path you traced to reach the chips and exit the level.